The latest iteration of the Pulsar Digisight, the feature-laden LRF N970 with built-in rangefinder, is the current daddy of NV digital scopes. The first Digisight to appear was the model 550, and despite one or two shortcomings it proved a success. True to form, Pulsar has gradually improved this earliest version so that its latest model, the LRF N970, is a very good piece of night vision equipment indeed. As I have said previously, I am not convinced that all the features offered by this and other digital NV units are strictly necessary. However, I am probably in a minority as I'm sure many night shooters, and the younger ones in particular, will thoroughly enjoy using the 'toys' the latest Digisight boasts. The Digisight has revolutionised night shooting, but is its latest incarnation worth shelling out for? 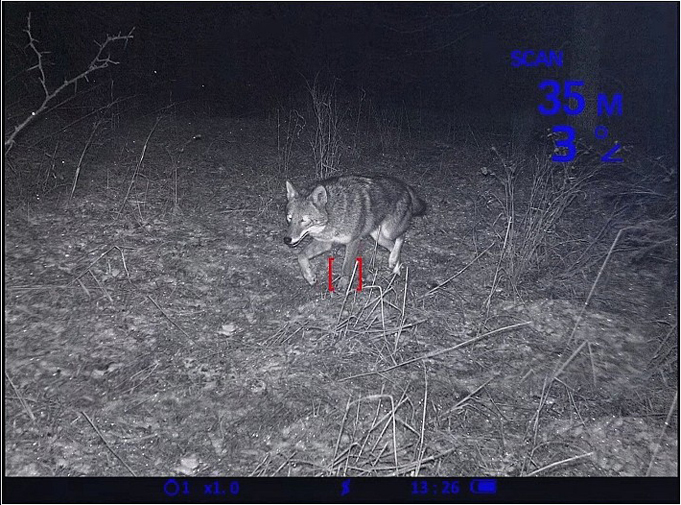 Perhaps the most important advance is the built-in rangefinder, I, and many other regular users of NV equipment, have long wanted a reliable rangefinder for use under cover of darkness, particularly when hunting foxes. Judging range at night while peering through NV gear is extremely difficult and I defy anyone to accurately range targets on ground that is unfamiliar to them. There have been attempts to manufacture a really reliable night-time rangefinder and Pulsar, as part of its Quantum series, offers thermal spotters with a built-in rangefinder. The Digisight's zoom facility (up to 14x) is useful in the field when positive identification of quarry is required. To be honest, though, I have found that while this will give an indication of range, by its very nature it is nowhere near as accurate as a daylight unit. This said, Pulsar's latest Digisight has addressed this problem and I am pleased to declare that it works! The manufacturer claims a ranging ability out to 400m but, in real terms, I would say that's a little optimistic for night use. I tried it out to 300m, however, and that worked fine - and, above all, it was accurate. I have little doubt that rangefinding in darkness will become the norm quite soon but, for now, the Digisight has certainly set the standard. The controls on the unit are easy to find and in all cases user friendly. These include the infrared control, range-finding button, focus control and menu, while the power control is located on top of the unit. 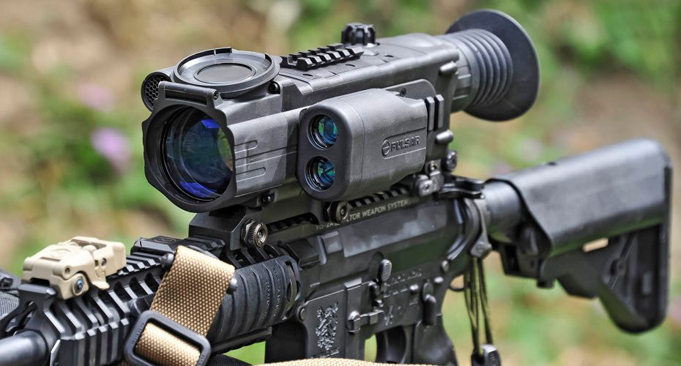 Relatively lightweight, the Digisight is easy to mount and versatile in use. The equipment now features the usual video and external power ports for those who wish to record proceedings and override the four AA batteries that provide the unit's basic power source. The EPS3 has always been my preferred external power source as I have found it will provide up to four years' constant use and can be used with other NV devices, including thermal imagers. Most usefully, the Digisight comes replete with two Weaver accessory rails, one on top and one on the side, which allow the fitting of additional IR gear, if required, and an external battery pack - a piece of equipment that, for those who use any form of NV, is almost essential. The mounting of the Digisight has always been very straightforward, and when first unpacked you'll find a separate mounting plate that can be fixed to the unit with three screws. This allows for a choice of positions and is an excellent element given that far too many NV scopes can cause eye relief problems. 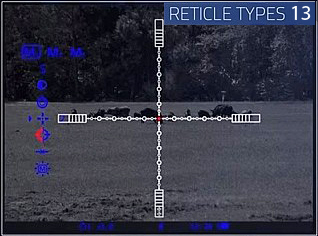 The item's menu offers a wide range of options, including 13 reticle choices and the ability to change reticle colours. You can also check elevation angles and tilt. The zoom facility (up to 14x) is one of the Digisight's key attributes that can prove really useful in the field, particularly when positive identification is required. Overall, then, the Digisight is a pretty impressive piece of kit. But, as always, the acid test is: how does it perform in the field? I prefer my NV gear to be as simple as possible. So while the Digisight offers many excellent features I opt for the basics and, as with all my NV equipment, set it up before embarking on my nightly fox control work. Much depends upon where you are shooting as to whether you have the time to vary settings and so on. I set out for a night on the stubbles to pursue a fox which had been removing ducks from a nearby smallholding. It had been seen crossing the stubbles each night on its way to the scene of the crime and I chose to wait for it there rather than in the farm. During daylight I had already taken out a fox with the day scope, but as the light began to fade I switched to the Digisight-equipped Sauer 243, a rifle that doesn't take prisoners! In fact it was all very easy as, occasionally, fox control can be. As the light dimmed the said fox was, as predicted, spotted making its way down one side of the field, totally unaware of my being tucked away. 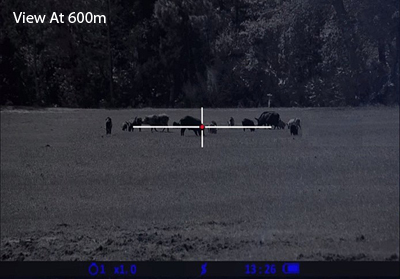 As it got to within 100 yards it presented a safe shot and a shout stopped the animal in its tracks. I use 75-grain Hornady ammo in the .243, its flat shooting and good out to ranges well beyond my capabilities, and once again it did the job. Overall, a very successful run-out with the Digisight. I have little idea what the next variation of the Digisight may offer - but, suffice to say, the current LRF N970 does everything and more that you'd require of a digital scope. Not overly heavy, easy to mount and with a useful range of features it's hard to fault this latest offering from Pulsar.